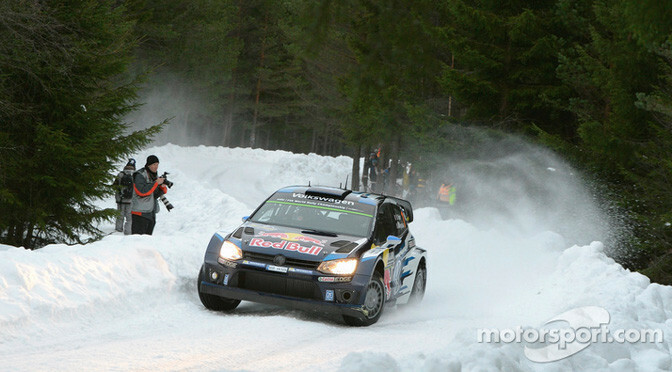 Snow and ice spectacular kicks off with thrilling spectator stage in Karlstad. Pontus Tidemand, the 24-year-old Swede, starred in an RRC-spec M-Sport Fiesta to grab the lead of Rally Sweden around the twisting 1.9km Karlstad superspecial on Thursday evening. Tidemand, a star in rallycross, completed the stage in 1m32.1s, 0.3s ahead of a fired-up Mads Ostberg in his works Citroen DS3. Although defeated on the stage, Ostberg was delighted to beat world champion Sebastien Ogier in their head-to-head run, even if Tidemand stole the show overall. “It was quite good, a proper rallycross start,” said Ostberg. “The stage was quite nice, so I pushed a little but but not too hard. Ogier made a very slow start from his inside lane on the side-by-side layout, and could only manage the seventh-fastest time, 1.1s off the pace. Jari-Matti Latvala was further 0.4s off the pace in third, with the first of the Hyundai’s, Thierry Neuville, in fourth. Andreas Mikkelsen was fifth quickest in his VW Polo, after running wide on long left-hander. Several drivers bemoaned a complete lack of traction off the startline, while warm ambient temperatures on the stages have been tipped to cause disruption this weekend.